The central region of Italy Tuscany is famous for its landscapes, and in this tapestry "Poppies of Tuscano" we see the Tuscan landscape in the late afternoon sun and a field of bright red poppies. Based on the work of artist Art Fronckowiak, this piece has his signature looks of strong saturated color and a style which resembles that of impressionism. The landscape of the region is hilly and mountainous and the cuisine from the region is world famous. The red poppies in particular are well known on this region as the abundant sun favors their growth to create a distinct color effect over the region. Here we see them across the hills nearby and some popping up in the foreground. The color palette here is cohesive and reflects the golden hues of the late afternoon sun almost at dusk, in this special region of Italy. 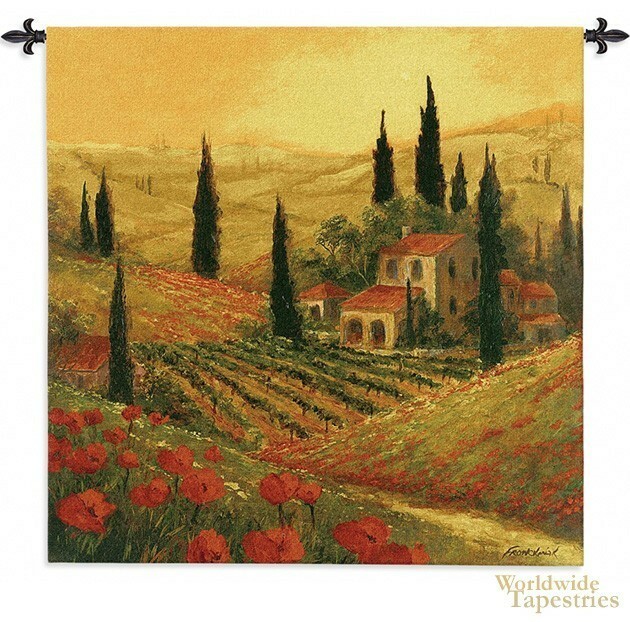 This landscape tapestry "Poppies of Tuscano" is backed with a lining and has a tunnel for easy hanging. Note: tapestry rod and tassels, where pictured, are purchased separately.